Caprese Mushrooms are deliciously simple appetizers to make. Use the large portabella mushrooms for this recipe. They make hearty appetizers or a great side dish. I like using beefsteak tomatoes for this recipe. They are nice meaty tomatoes that compliment the mushrooms very well. The portabella mushrooms should be baked for around 20 minutes with a little Pesto and olive oil brushed on top to give it a full body flavor. Traditionally I’ll use fresh buffalo mozzarella cheese to top this dish but on occasion I’ve used fontina which gives it a pungent intense flavor. These Mushrooms should be enjoyed with a nice crisp Pinot Grigio. Remove the stems from the mushrooms and clean with a damp paper towel. Mix together the pesto and olive oil. Brush the mushroom caps on both sides with the mixture. Place the mushrooms on a slightly oiled baking dish and back for at least 20 minutes or until the mushrooms are fork tender. Slice the tomato into four equal slices. Brush with oil and place on the top of the mushroom and bake for around 10 more minutes. 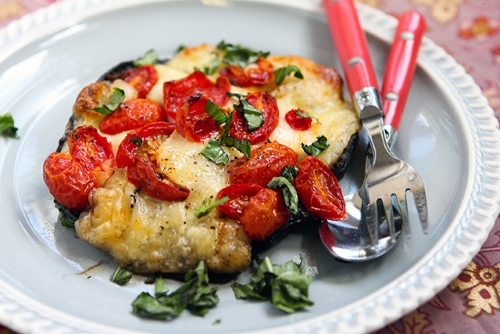 Place a slice of cheese on top of the tomato and bake until melted. Add a some fresh basil on top and serve.